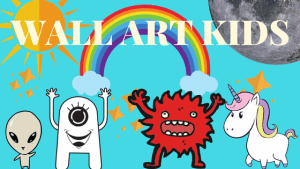 I’m not a girly girl… but it has to be said, I do love rainbow’s, unicorns and fairies As such, I wanted to do a post entirely devoted to rainbow Decor and rainbow wall art for kids rooms. One of my favourite ever characters on TV when I was a kid – was Rainbow Brite. Do you remember her?. 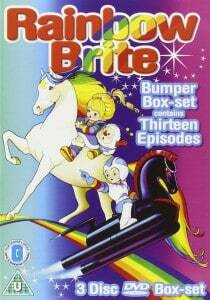 Rainbow Brite was somehow such a magical program for me at the time. If you don’t recall the program…. this is Rainbow Brite!! So far from experience, my own children have really enjoyed watching some of the old retro cartoons too, which is a pretty nostalgic experience for me when I get the chance to indulge. But it’s also lovely to share some of those classic films, cartoons and Tv programs from your childhood with your own children. So, let the rainbows commence…. How gorgeous is this? An awesome combo between painting and night light. This would make the perfect addition to a nursery or toddlers room, (although, I’d really quite like it myself!). This is a handmade item and is 30cm x 30cm. The lights are powered by AA batteries. Luckily, they ship anywhere Wordwide! I only recently discovered the great website Fine Art America – where you can purchase some really exceptional prints from some of the worlds best artists and photographer’s. You can buy the work in a variety of ways, whether you want the print framed, on canvas, or even on greetings cards or posters. You can even transform your own photographs, either for yourself and your family – or you can create a business by transforming your own photographs and selling them. The prices are very reasonable too, with a regular print priced at £24 for example, or a full canvas priced at £40, which various other options available. This rainbow print is gorgeous and would look perfect in a nursery. 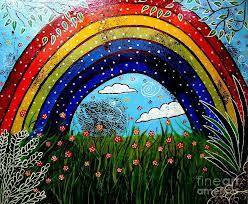 There are several other rainbow varieties of print in a similar style on their site. How gorgeous is this! 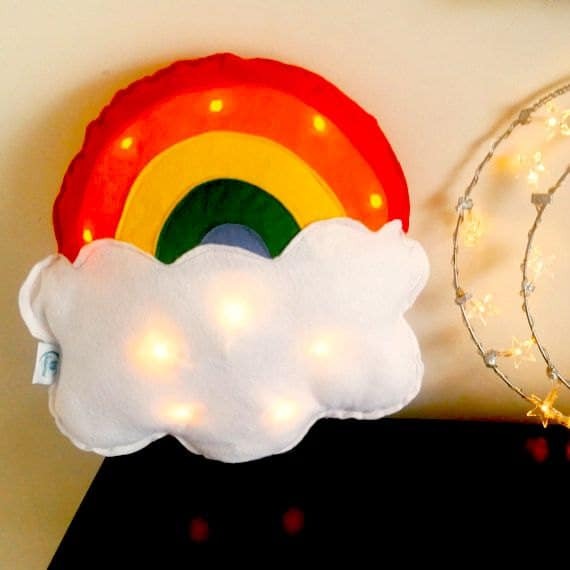 This very cute handmade rainbow and cloud pillow light from Etsy, could easily be attached to the wall next to your child’s bed and used as a night light. 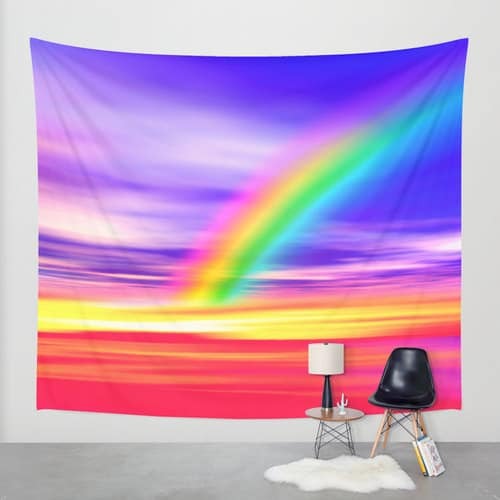 A perfect addition to any rainbow themed room. Made from felt, with 10 white LED fairy lights included and shipped worldwide from England. 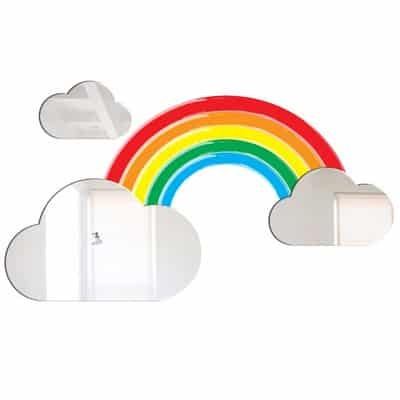 This gorgeous rainbow and clouds mirror set includes 3 mirrors and a rainbow, it comes with adhesive stickers, so is really simple to apply. Again, this mirror would be perfect in a nursery or small childs bedroom, perhaps on the wall next to the bed. It is light weight and shatter resistant, it is also up to 10 times stronger than glass! This can be purchased at wayfair.co.uk. I couldn’t do a Rainbow post without including a rainbow projector light could I? (Yes, I do love my projector lights). I remember going to a planetarium for the first time when I was a kid and just being desperate to have something resembling that at home, so I could look at the planets and stars projected on my wall and now it’s great that you can get a multitude of Light projectors that can have this sort of effect on your walls in various designs. 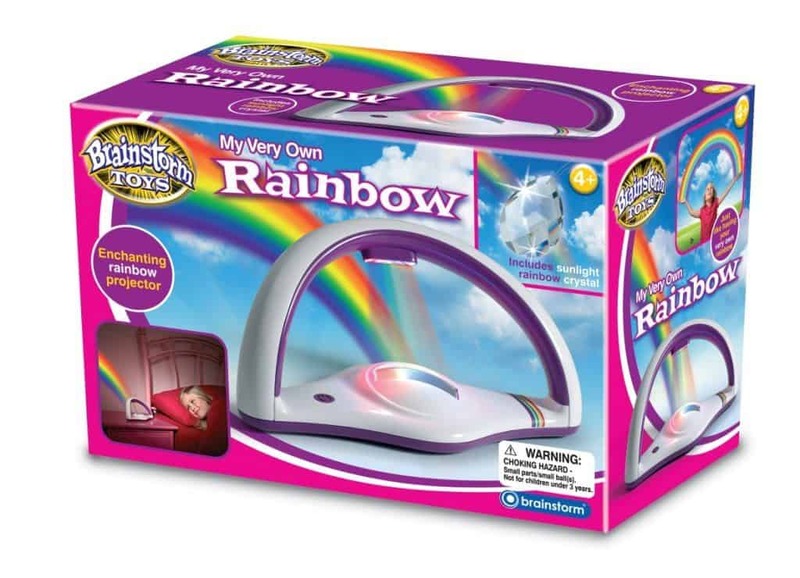 This one requires 4 AAA batteries, also comes with a little booklet all about rainbows and a crystal to attach to a sunny window, which causes rainbow pattern effects to dance around the room. 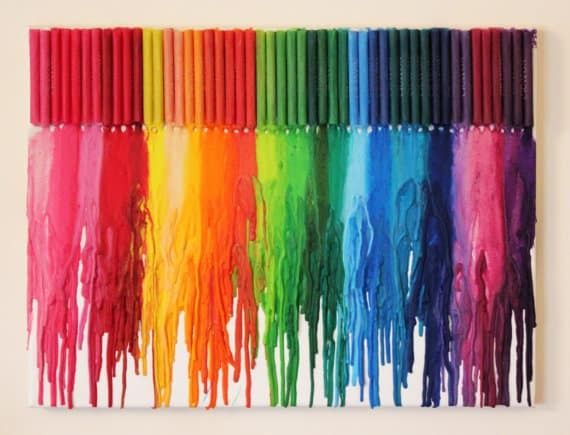 I love this melted crayon canvas. You can buy these ready made, (which saves on the potential mess) or you can create one yourself — to create a melted crayon canvas, you need to attach an assortment of crayons to the top of a canvas with a glue gun, you can use any combo of crayons you want, but for a traditional rainbow effect – go for the combination of colours above. You then need to prepare your area, either put down plenty of newspaper or prepare to melt the crayons in the garden. You the proceed to melt the crayons using the high setting of the hair dryer, facing downwards towards the crayons. This can take quit e long time so, you need to be patient. Gradually go through colour by colour, until you have the melting effect above! Alternatively you can buy the ready finished result. This is an adorable weather bunting, including individually handmade felt shapes relating to the weather. It includes 8 sunshine yellow hearts, 3 white clouds, 2 white rain clouds with blue heart raindrops and two rainbows! The entire bunting is 300cm in length approximately. 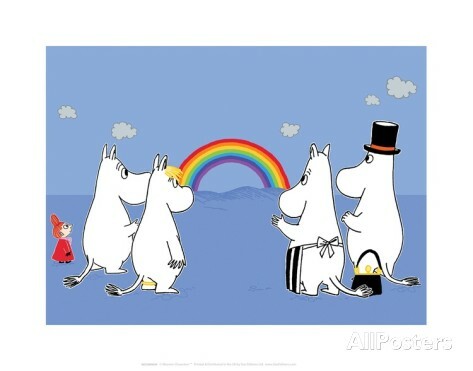 I’m a Moomins fan too and love this sweet poster showing the Moomins admiring this rainbow! This poster is 36 x 28cm from allposters.co.uk. Check out this amazing solar powered rainbow maker, which will fill your child’s room with gorgeous rainbows. 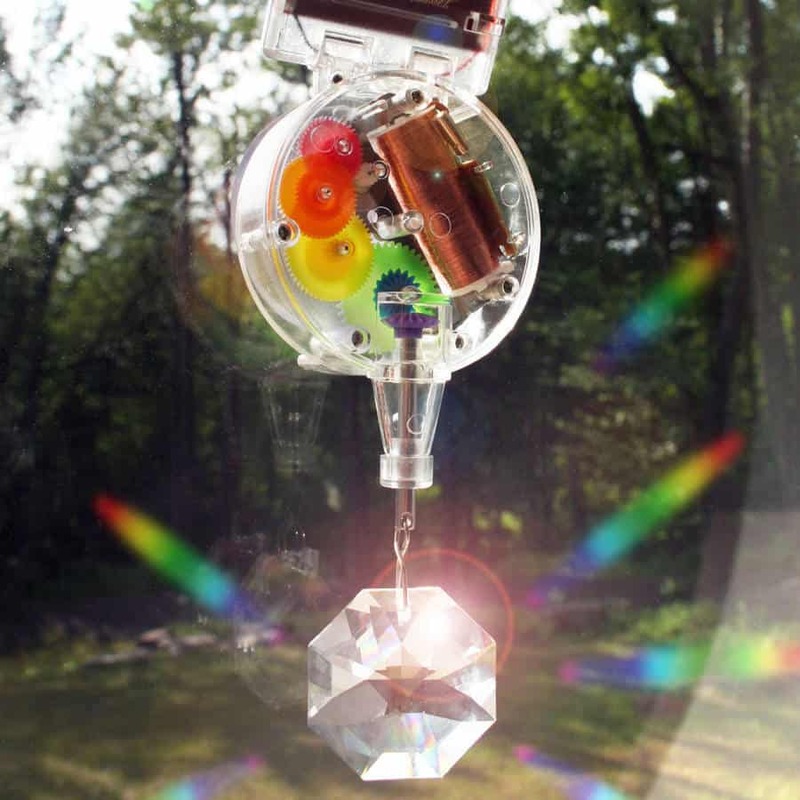 You need to place the rainbow maker close to a window that has the most direct sunlight, then the solar panelled motor will turn the Swarovski crystal around and the light will propel rainbow patterns over the walls and ceiling. The clear casing around the motor, allows you to view the cogs in motion. Free delivery to the UK and an international shipping option available. They are also durable enough for in and outdoor use. Other designs also available. 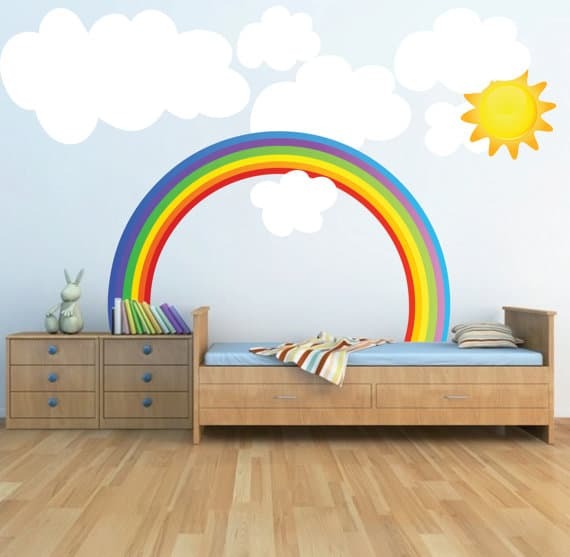 A very pretty rainbow wall sticker set for your kids bedroom. Ships worldwide from California. Take note that the sun and clouds are sold separately. There are 3 sizes available 14″x22″ includes 2.5″ wide, 22″x36″ includes 4.25″ wide and 48″x78″ includes 9.5″ wide. 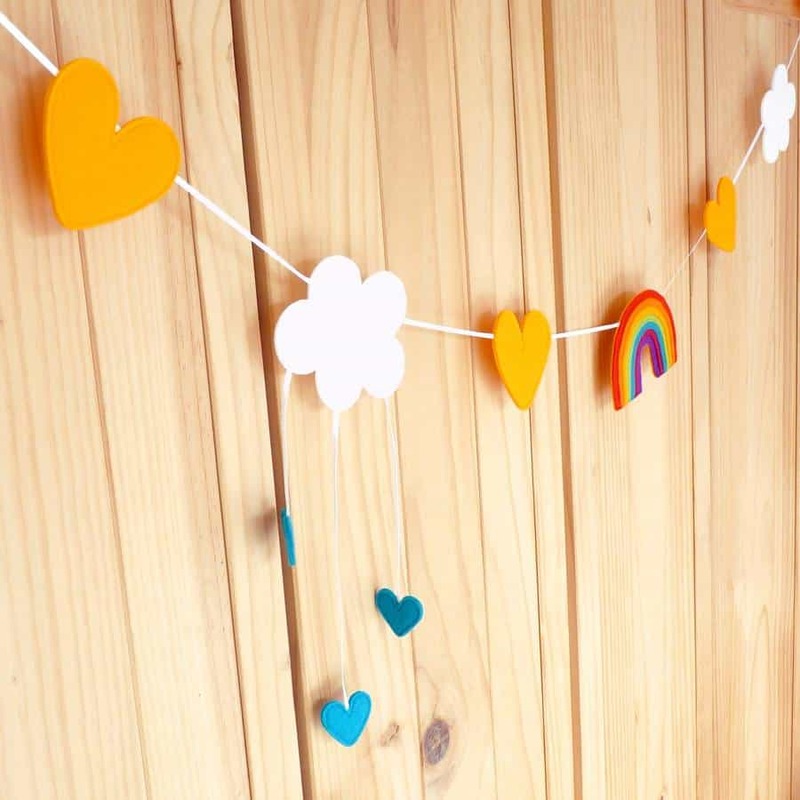 This rainbow decal is both removable and reusable! You can also look up a variety of rainbow wall stickers over at our rainbow wall sticker page. Are your kids rainbow fans too? !